The Ahmadiyya Muslim Jamaat in Croatia succeeded to carry out a humanitarian Project with the help of Humanity First Germany at 10th of December in Zagreb, Croatia. 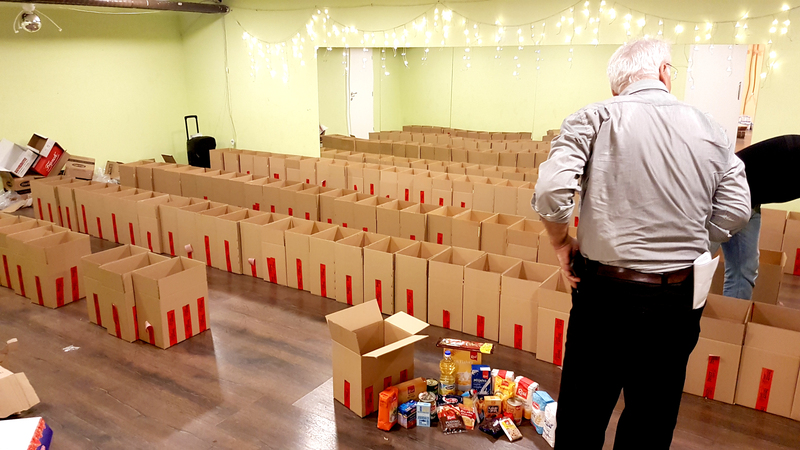 “Mali Zmaj” a humanitarian charity Organization located in Zagreb asked for help and support to organize food packages for needy children and their families. Mali Zmaj is mainly working with unprivileged children or children living under harsh circumstances. Mali Zmaj was planning to distribute food packets and some small presents for children before Christams. Humanity First Germany was generous enough to approve the help request for Mali Zmaj. Sead Mulabegovic pondering how to accomplish huge task of packing the items in cartons. The planning that had started couple of months ahead to the deadline included talking to various companies to get a reasonable price for the list of items that maintained more than 26 items (Milk, oil, flour, sugar, pasta, tuna, rise, …). The number of food packets was 160 in total. Project needed to provide cartons to store these items. Therefore Mr. Sead Mulabegovic did great effort and could get free cartons for packing from a company. Finally the items were delivered to Mali Zmaj and a team of HF-Volunteers came to unload the truck that had a sum of five pallets of goods. After unloading and sorting the items HF-Volunteers immediately started to pack the food packets. Therefore thanks to Mr. Sead Mulabegovic, Misel Androic, Kaleem Ullah Malhi, Yasser Almasri, Renato and to all additional Volunteers from Mali Zmaj. Finally HF-stickers were placed on the packets and these were prepared a couple of days before the main event would take place. Meanwhile the Media was invited to share the details of that humanitarian action with the Croatian society to motivate people to help people in need and to carry out the message: “Humanity First”. A pleasent smile by a needy after getting the food packet. On the 10th of December 2018 families started to come to collect their donation of food packets. Some of the food packets were also sent via Post in the evening to those families who would not have the opportunity to come by themselves to collect the donation. During the period of distribution, a big team of volunteers was present. The media came also to do coverage. The main news channel HRT4 gave a brief report about our project in the evening news. One other TV channel “Jabuka TV” broadcast the next day. By the grace of Allah Almighty Humanity First in Croatia could help more than 600 people. Media Report Link with English subtitles. Mashallah. AMJ Croatia and Humnaity First Germany doing a great job. Keep it up. As always Humanity First is there to help others. As our community motto is “ Love for All Hatred for None “. May God accept our efforts for mankind.